The company raised `451.3 crore through the issue, which saw investors put in subscriptions for 10 times the number of shares on offer. 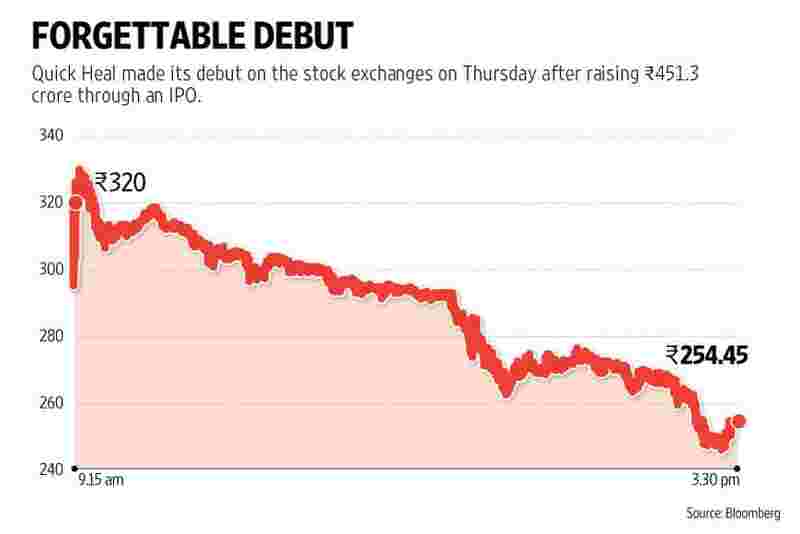 Mumbai: IT security solutions provider Quick Heal Technologies Ltd, which listed on stock exchanges on Thursday, saw its stock price decline by almost 21%, as the company found itself in the middle of a public spat over shareholding. The company recently disclosed information about an ongoing tax litigation, which also hit the stock on its debut on stock exchanges. Quick Heal sells its security products under the brands Quick Heal and Seqrite for desktops, laptops, smartphones and network security and data loss prevention. Quick Heal had issued shares at ₹ 321 apiece in its initial public offering (IPO), which closed on 10 February. The company raised ₹ 451.3 crore through the issue, which saw investors put in subscriptions for 10 times the number of shares on offer. Despite the strong investor interest, Quick Heal shares closed at ₹ 254.45, down 20.73% from the issue price. On Wednesday, a day ahead of listing, Manohar Malani, managing director at Kolkata-based firm NCS Computech Ltd, wrote to capital markets regulator Securities and Exchange Board of India (Sebi), complaining about the fraudulent transfer of 20,000 shares of Quick Heal Technologies Ltd, which he claimed belonged to him and his family. Mint has seen a copy of the email complaint sent to Sebi. Malani claimed that in 2000, he and four members of his family had subscribed to 4,000 shares each of CAT Computer Services Pvt. Ltd (which was later renamed Quick Heal). The red herring prospectus (RHP) filed by Quick Heal on 29 January does not feature either Malani or any of his family members as shareholders in the firm. NCS Computech was a distributor of Quick Heal products till 2014. Quick Heal has several pending criminal cases against NCS Computech, according to data from its RHP filed with Sebi. In a response to Malani’s allegations, the firm on Thursday issued a clarification to the stock exchanges stating that “it has not received any amounts towards share application money or for subscription of shares from any of the claimants in the year 2000 or at any time thereafter and has never allocated any equity shares of the company to the claimants at any point of time". It added that the register of members and shareholders, register of share application and share allotment and register of share transfers of the company do not indicate that any of the claimants were shareholders of the firm at any point of time. While the company in its clarification claimed that there was no record of Malani having held shares, in its red herring prospectus, the company had said that share records for the 1995-2007 period are missing. “We are unable to trace certain corporate records in relation to our company. These corporate records include prescribed forms filed with the RoC (registrar of companies) by our company relating to certain allotments of equity shares made by our company and increase in authorized share capital of our company. These documents pertain to the period between 1995 and 2007," the company said, adding that there is no assurance that it will not be subject to penalties on this account. A few weeks ago, the firm informed investors that it has a tax notice regarding the levy of service tax amounting to ₹ 78 crore, taking the total tax litigation to ₹ 140.7 crore. Market experts believe that the regulator will initiate an inquiry into the matter, given the sharp fall in the stock’s price on Thursday. However, they said that it is too early to say whether there have been corporate governance lapses at the firm. “This is a case that calls for investigation by Sebi and I am sure it is already being done. As of now, it is impossible to say who is right or wrong and we should not judge it as a corporate governance issue. With high levels of due diligence, investment bankers would not typically not miss out on something like this," said Prithvi Haldea, founder and chairman of Prime Database. Most technology companies, especially in their early years, are not very careful about documentation, and instead focus on other areas such as fund-raising, operations, marketing, expansion, said Haldea. “It is a one-off and a company-specific thing, and will in no way hurt IPO market sentiment," he added. According to Shriram Subramanian, managing director of proxy advisory firm InGovern Research Pvt. Ltd, the timing of the complaint raises doubt about its authenticity. “To some extent, one can question the investor’s (Malani) timing of allegation. It is not clear who is at fault, or is it just an attempt of creating nuisance or disruptions, because there was ample time to raise this issue," he said. Quick Heal was the third company to hit the primary markets this year after TeamLease Services and Precision Camshafts.